I was on vacations, driving in Bonita Springs on the road 41 down to Naples to visit a friend, around 9pm. A friend of mine was in the car with me. We suddlenty look to the East and saw what looked like UFOs. We had seen a big fireball/ball before, in December 31th, hovering in the same neigbourhood and just moved over the private pool we were bathing. It looked the same, but they were 4-5 this time, and farer. We decide to park and try to take a digital video with my mobile phone. On December 31th, I had no time to get out of the pool, find the mobile phone and tape or take pictures, the orb was already to far and high to tape anythng. On the end of the video enclosed, you can see that we loose the sight. But before I recorded, I could say we observed the orbs for about 2-3 minutes. Maybe there probably here nefore we realize. 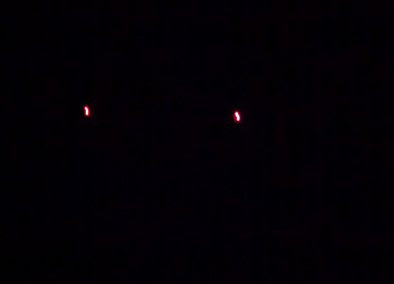 I can say its not the firt time we see UFOs, and we were hoping to catch a video someday. Thats why we didnt submit any report before, we wanted to have a video evidence. We are used to look up in the skies. I dont know why, but we have observed a few times UFOs at dusk. UFO video submitted in from Austin, Texas. Please view this video in full screen. 5 -7 years old, was found in the Atacama Desert in Chile a few years ago. The narrator of this video explains it was tested and the DNA results, which only have just come in, proves this little being is not human or related to anything here on Earth - which makes it likely "extraterrestrial." Previously- Dr. Steven Greer: "After many weeks of travel, we are back to report that amazing results have been obtained from our study of the small possible ET body. Steven M. Greer (June 28, 1955) is an American osteopath and ufologist who founded the Orion Project and The Disclosure Project. Greer says, "Dr. Bravo, Emery Smith and I traveled to the country that is now home to this small possible ET body and were able to successfully obtain extensive X-Ray and CT Scans of the entire body. We were also able to obtain DNA samples under sterile, surgical conditions. These DNA samples are now being studied by one of the world’s top geneticists." On Earth Day, Dr Steven Greer's long awaited ET & UFO disclosure movie 'Sirius', will be available here to view at RealUFOs as part of the global streaming of the new documentary. The question is NOT - Do they exist? The question is - How are they getting here? If you have a sighting you would like to add please submit it using the submit button above. Early morning of April 11th 2013, I was woken by the dog going nuts!..i took her out, came back in. got into bed and that is when I noticed a flash of light...like lightening. I didn't think much of it till I saw it repeat. then again and again..steady. more of a blinking notion.....in the same repeated format...I've not seen lightening act that way before. So got dressed grabbed the dog and went out to the street and stood in the middle of the road. It was North from me, on the Malahat in BC, Vancouver Island. The light was high up and akin to lightening, amongst the clouds. I tried to discern from it's direction what might be creating it. The fire station was to the left of it ( discounted that idea) The highway was to the right ( discounted that idea) I realy dont' know what was causing it...all I can say, on first flash...I thought it was lightening...by the 3rd..i knew it wasn't. it was one colour...a white silvery light. it was wide.....like as if.....between the cloud coverage.....Blinking about every 5 seconds.....I thought of getting into my car to drive to a clearer area and view..but chickened out. I regret that now... I noticed it was gone by about 2.15am. . Saw this large object in the sky, 8pm at night, on the 4/4/13. It appeared in the north east, getting larger and slowly moving towards the south west over town. It stopped moving and hovered silently for approxiamately 4 minutes, then retreated back to the direction it had initially appeared, growing slowly smaller, then in last few seconds retreated at speed, instantly disappearing. I managed to get three photo's, the first two undiscernable, the third with more defined shape. 1st Aprl / 30th March 11:45pm Alternating colors. Emitting single smaller blueish lights that seem to fade. Has been in the same location for sometime now. Seems to be over the Mission beach area. Very beautiful, and positive frequency from it. Seemed as if they were having fun. The flight pattern was straight up to the sky, coming straight towards me at a alarming rate like nothing ive ever seen before, i thought it was a nuclear bomb! Then all of a sudden it reduces its speed and slightly turns like a motorcycle wood, then increases speed again and is headed to a whole other direction 90 degrees right of them. Then the spacecraft moved as if it wanted to be seen, was like a dish with top as usually interpreted. Blue lights circulating the dome and every turn a white light sparks, u can clearly see the shape of the objects because how clear it was! The blue was vibrant and different i liked it, im just a young man from baltimore i have a great video i promise on my life i will drop dead right now if im exaggerating anything, i am happy to experience somthing that the WHOLE WORLD is questionable about. The Maury Island Incident is being made into a new short film based on a long-forgotten UFO encounter that happened off Maury Island, WA on June 21, 1947 . 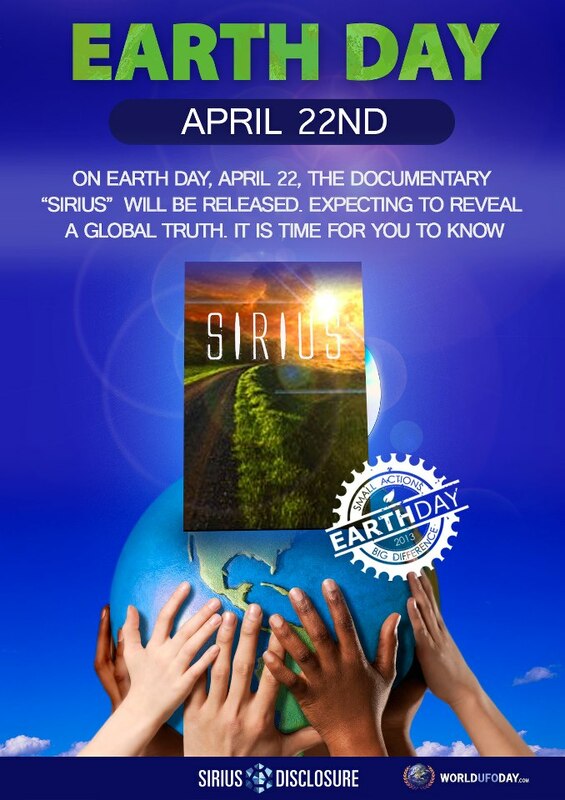 You can read more & support the new movie here. The incident took place shortly after June 21, 1947. On that date, seaman Harold A. Dahl, out scavenging for drifting logs claimed to have seen six UFOs near Maury Island Vashon Island. Dahl, his son Charles, an unnamed hand and Dahl's dog were on the boat Dahl reported seeing four, five or six (the nitial FBI report says four or five)"doughnut-shaped objects" flying in formation over the area where his boat was. He said he could see blue sky through the holes in the center of the discs, and that there appeared to be port holes lining the inside of the ring. One of the craft appeared to be malfunctioning, Dahl reported, and another craft edged up to it, then retreated. At this point the troubled craft began ejecting objects through the inner port holes. the craft appeared to be malfunctioning, Dahl reported, and another craft edged up to it, then retreated. At this point the troubled craft began ejecting objects through the inner port holes. Slag-like material began hitting the boat and damaged the windshield, the wheel house and a light fixture, and killed his dog on the deck. He said his son was also slightly njured by falling debris. Dahl claimed to have taken a number of photographs of the UFOs, and recovered some type of slag ejected from the craft that malfunctioned. Dahl also recovered samples of sheaves of lightweight white sheets of metal that fluttered like "newspapers" out from the inner ring of the troubled UFO to the ground. malfunctioned. . Dahl also recovered samples of sheaves of lightweight white sheets of metal that fluttered like"newspapers" out from the inner ring of the troubled UFO to the ground. The is a highly interesting UFO case from the Peruvian Air Force that was featured on the UFO Hunters series. Below is a full report on what happened and how this case made it into the popular TV series. Assuming that the intruder was a spy aircraft, the base commander ordered an immediate scramble of a Sukhoi SU-22 fighter-bomber with orders to destroy the target, originally supposed to be a sort of aerostat balloon located 5 kilometers away. The time was 7:15 a.m. and base personnel -- a complement of some 1800 men -- were in formation, witnesses to this event. The moment the object was within his sights, suspended and motionless some 600 meters over the ground, Lt. Santa María pulled the trigger, firing a powerful hail of bullets from his aircraft's 30mm guns. Sixty-four rounds out of a total of 160 were fired against the UFO. Up to that moment, the object had not been detected by radar. For this reason, the Peruvian pilot did not avail himself of the plane's missiles. He only sought to get close enough to the object to fire again, having over 100 rounds left. When the Peruvian Sukhoi was already near the UFO, the object made a sudden stop, violating the laws of inertia. The fighter-bomber flew past it, with both vehicles at an altitude of 11,000 meters (36,000 feet) "the object pulled away quickly, gaining altitude at the same time. Later, it stopped abruptly, and I had to maneuver to avoid colliding with it," said Santa María. It was thus that Lt. Santa María and his aircraft went from being hunters to prey. He was being pursued by the UFO at 19,000 meters (62,000 feet), nearly 1000 meters beyond the aircraft manufacturer's specifications. Furthermore, his fuel supply was running low. Peruvian authorities jealously guarded this incident and it recently came to light during a declassification of documents by the U.S. Department of State. Pilot Sightings - Giant UFOs & Alderney UFO Sightings! The team probes the skies over England following an airline pilot's official report of a pair of UFOs he believed to be at least a mile in length, and a review of other sightings of gigantic unidentified craft seen over the United States. On April 23, 2007, captain Ray Bowyer was flying a routine passenger flight for the civilian airliner Aurigny Air Services, when he and his passengers gained progressively clearer views of two UFOs during a 12 to 15 minute period. Bowyer had 18 years of flying experience, and the 45 minute flight was one that he had completed every working day for more than 8 years. 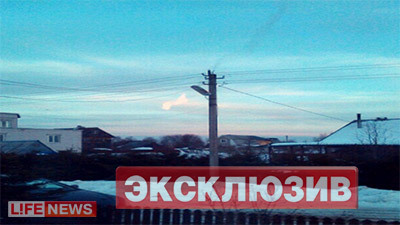 A large and strange object crashed in Russia on the 7th of April 2013. Residents said the object hovered for sometime before it crashed, and this caused much alarm. Filmed using night vision, this strange hovering object was seen after a plane passed by. It tends to hover for some time and could be anything, although the filmer insists it was an object of interest not visible to the human eye.  This stunning parallel UFO video was filmed above homes in Millville, New Jersey on the 5th of April 2013. Note: If anyone in the area also saw this Ufo please respond to this post with your description. My husband saw something in the sky in the backyard. He saw lights above the neighbors shed. Went outside and witnessed to orange red lights in the sky. 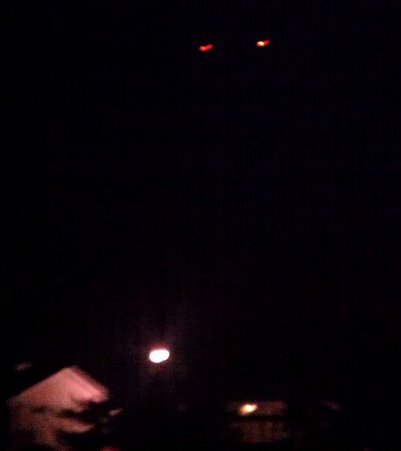 It passed over our house, looked like a wing and when it passed it covered the stars in the background behind it. Not sure what we saw, but by the time we got to the front of the house it was in the distance and disappeared. During the whole time we seen the flying object there was NO sound.